Turner Drake & Partners Ltd.: We Add Value. We appraise, but we are not "appraisers": our property advisory Valuation Team adds value to every assignment ... a goal we embrace as part of every real estate valuation and appraisal exercise. We have the training, resources and mindset to identify and unlock latent value in your real estate ... or, if the purpose of the assignment is potential litigation, to limit the potential for a costly court action by engaging in an open, consultative and transparent process, the outcome of which is a compelling, well researched and supported valuation conclusion. It is a common misconception that every commercial property has a single value. Not so! Yet we are frequently asked by professionals, such accountants and lawyers, as well as real estate owners, what it will cost to appraise a (specified) property. The International Valuation Standards (IVS), adopted by Canada, and incorporated into the Royal Institution of Chartered Surveyors’ Global Valuation Standards, specify six types of real estate value (Market, Rental, Equitable, Investment, Synergistic, and Liquidation). The Appraisal Institute (of America) has identified ten distinct, and valid, property valuation bases in common use in North America. Legislation, case law and the purpose of the real estate assignment, result in many variations of these ten property valuation bases. Any conversation about a valuing your property has to start with an understanding of the purpose of the valuation assignment or you can end up with a conclusion which is worthless at best, or seriously misleading at worst. Our property advisory Valuation Team will then advise you as to the appropriate valuation base for your purpose. Purchasers of real estate appraisal services often have a value amount in mind for their property. However a real estate appraiser who tailors their property valuation conclusion to their client’s expectations, commits fraud ... and their client is similarly culpable if the intended deception is intended to result in financial or personal gain. It is also self-defeating: property valuation reports now rise and fall on their credibility, not just on the reputation of the firm that issues them. The recurrent global financial crises laid bare the inter-dependence of economies and resulted in international accounting and property valuation standards ... and far greater scrutiny. The bottom line: if the property valuation and advisory report is not robust enough to withstand rigorous scrutiny it is worthless. Financial and taxation regulatory standards are constantly evolving and becoming more stringent. We therefore monitor them and meet with end users, such as the banks, on a regular basis to ensure that our valuation and advisory reports specifically address their areas of concern. We listen and communicate. We recognise that property owners know more about their real estate than can be gained from our property inspection, however detailed. We start the conversation before we draft the Terms of Engagement to confirm that you are requesting the correct type of property value base and level of real estate reporting necessary to satisfy the end user and purpose of the valuation and advisory report. We continue that communication throughout the real estate assignment, making sure that we understand your business’ operational, locational and market requirements if it is a Special Purpose Property such as a fish plant or hotel ... or the issues, if the purpose of the assignment is to minimise the potential for expensive litigation. Informed advice: the product of trained minds. Members of our property advisory Valuation Team are the product of our unique, seven year training program which blends undergraduate and post graduate degrees in real estate, twenty five in house modules and mentored experience with our Valuation, Property Tax, Lasercad® Space Measurement, Counselling, Economic Intelligence, Planning and Brokerage Divisions. This program endows them with a much broader view of the real estate spectrum, a necessary prerequisite in today's rapidly changing, global economy. It arms our property advisory Valuation Team with the knowledge, and access to technical expertise, to enhance real estate value, mitigate the risk of property depreciation, or reduce the potential for litigation. Specialist skills: a broader perspective. Commercial property asset management is multi-dimensional: unlocking latent value requires the application of a wide spectrum of real estate disciplines and resources, as well as the training to identify value adding opportunities. Our property advisory Valuation Team can call on the in-house expertise of our other Divisions (Property Tax, Lasercad® Space Measurement, Planning, Counselling, Economic Intelligence, Brokerage) to assist in identifying value adding opportunities such as property tax amelioration, planning opportunities for up-zoning (or an intervention strategy to prevent down zoning), increased “leasable area” by moving the building to the current BOMA (or more appropriate) measurement standard, a leasing strategy to take advantage of future supply/demand changes identified by our Economic Intelligence Unit, and so on. Market data drives property values. The availability of real estate sale prices, property assessments, rents, vacancy rates, operating expenses (common area maintenance & property taxes), building costs, financing, on comparable properties together with the ability to determine and analyse trends, is key to uncovering latent value in your property. Unfortunately Atlantic Canada is the most data deprived region of the country, but we have at last persuaded the three Maritime Provinces to release real estate sales information. 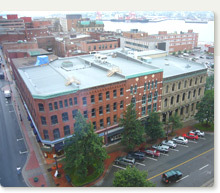 Our Economic Intelligence Unit conducts semi-annual market surveys on office and industrial buildings in the Halifax Regional Municipality, St. John’s, Moncton, Saint John, Fredericton, Charlottetown; gathering commercial property rental, operating expense, property tax and vacancy data. They also undertake apartment and parking revenue and expense surveys throughout the Region. Our Property Tax Division collects a vast amount of operating data on many property types. CompuVal®, our proprietary leading edge IT platform acquires, integrates and analyses this real estate sales, assessment, vacancy, revenue and operating expense data. We have built similar databases for Ontario. Our property advisory Valuation Team deploys CompuVal® to benchmark your property with similar real estate and runs trend line analysis to determine if there are opportunities to add value to your property ... all without additional cost to you, as part of the valuation and appraisal assignment. Quality control: our cost, not our clients’. We strive to be the benchmark by which others are measured. Our property advisory Valuation Team utilises a structured process which commences with an agreed Terms of Engagement, then proceeds through the property inspection (using surveys purposed designed for your property type), captures the physical, legal and fiscal attributes of your real estate, acquires and analyses market data using our CompuVal® Knowledge Base, identifies real estate value enhancing opportunities and determines the property value conclusion. The process is designed to leave no stone unturned and is governed by a quality system registered to the ISO 9001:2015 standard. Every six months we ask our clients to measure our Work Quality Performance on a five point scale ranging from “poor” to “excellent”. Local presence: a national outlook. Our roots have been firmly embedded in Atlantic Canada since 1976 and we keep a watchful eye on the region’s real estate markets to identify the risks and opportunities faced by an immobile asset such as your real estate. From our head office in Halifax Regional Municipality (HRM) our teams fan out to our regional offices in Saint John, New Brunswick, Charlottetown, Prince Edward Island, St. John’s, Newfoundland and Toronto, Ontario. Our local presence and national reach allows us to monitor the activities of international, national, regional and local players in the various real estate markets. We believe that you should know what our valuation and advisory services will cost before we commence the assignment ... there should be no surprises! We will provide Fee Quotations, and enter into a Terms of Engagement specifying the scope, prior to commencing the real estate valuation or appraisal assignment.